GBP/USD gradually dropped from the highs above 1.13300 and eventually slipped below 1.3200. Can it recover? It will not be too easy. 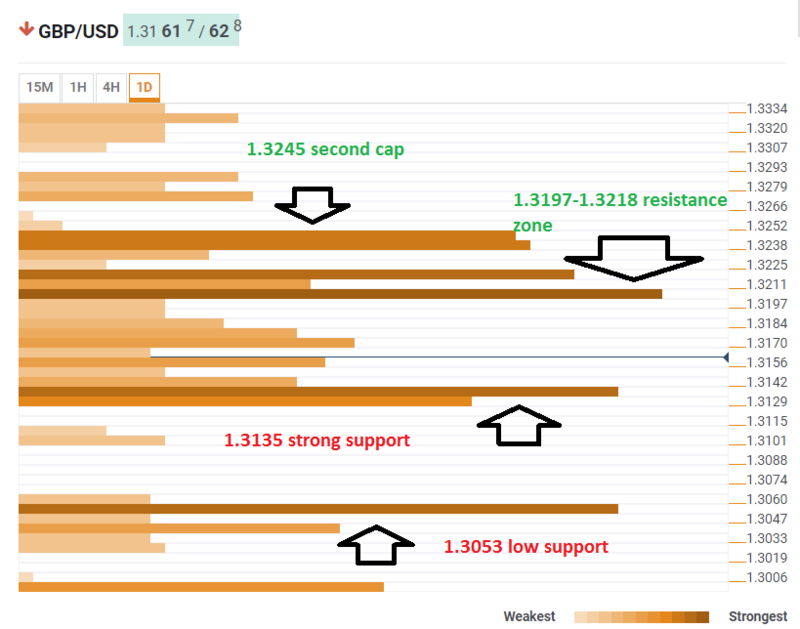 The Technical Confluences Indicator shows that cable faces fierce resistance in the area between 1.3197 to 1.3218. The area consists of the Fibonacci 38.2% one-day, the Simple Moving Average 10-4h, the Bollinger Band 1h-Upper, the SMA 50-1h, the SMA 200-15m, and the Fibonacci 23.6% one-month. The next cap is quite close as well: around 1.3245 we note the convergence of the SMA 5-1d, the Pivot Point one-day Resistance 1, the BB 4h-Middle, and the Fibonacci 38.2% one-week. The good news for GBP/USD is that it also enjoys significant support. 1.3135 is the convergence of the Fibonacci 38.2% one-month and the Pivot Point one-day Support 1. Yet if it falls further, the next cushion is only at 1.3053 where we see the confluence of the previous week’s low, the PP 1m-S1, and the SMA 100-4h.